Habitat and Ecology: H. barkerae is a bulb that is indigenous to the winter rainfall areas. It tends to grow in clumps amongst rock in heavy clay soils often in the shelter shrubs. 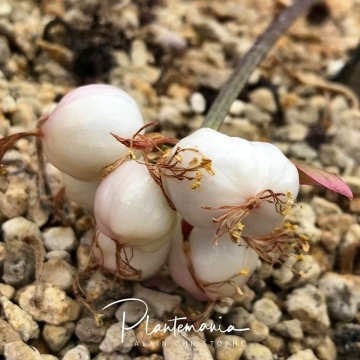 Description: Haemanthus barkerae is a rare deciduous, winter growing geophyte that has a thick fleshy bulb and two strap-like or tongue-like leaves with purple-maroon markings on the underside. This is a clumping species that grows up to 20 cm high. The flowers are pinkish with yellow stamens. It flowers in March-April (late summer - early autumn) after which the leaves will show. This seems to be a very variable species. Derivation of specific name: The name commemorates Winsome Fanny Barker (1907-1994), erstwhile Curator of the Compton Herbarium at Kirstenbosch National Botanical Garden in Cape Town, and noted for her work on Amaryllidaceae, Liliaceae and Haemodoraceae. Bulb: The bulb is mostly round in cross section and has a well developed neck. Leaves: 2 (occasionally one), dry at flowering, suberect to recurved, rather variable, narrowly ligulate to near elliptic, blue-green, 7- 80 mm wide, smooth or short-haired, patterned on the lower surface at the bases with dark green and maroon bars and spots. The leaves last from May to October and appear after the flowers which bloom between March and April. Inflorescence: Haemanthus barkerae has a more or less spreading flower-head held on a deep to pale pink scape, spathe bracts 4-6, spreading, acute, pink. Flowers: Pinkish 11- 21 mm long, with yellow stamens. Taxonomy notes: For many years herbarium collections of Haemanthus pumilio Jacq. 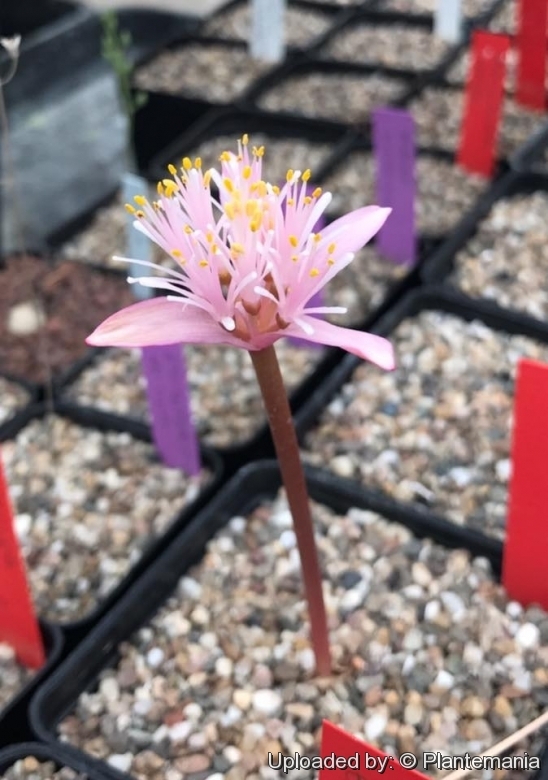 included specimens of a second species which went unnoticed because of its similarity - this similar but distinct species was named Haemanthus barkerae. 2) Raimondo, D., von Staden, L., Foden, W., Victor, J.E., Helme, N.A., Turner, R.C., Kamundi, D.A. and Manyama, P.A. 2009. "Red List of South African Plants". Strelitzia 25. South African National Biodiversity Institute, Pretoria. 3) Snijman, D.A. 2013. "Plants of the Greater Cape Floristic Region 2: The extra Cape flora". Strelitzia 30. South African National Biodiversity Institute, Pretoria. 4) Snijman, D.A. 1984. "A revision of the genus Haemanthus (Amaryllidaceae)". Journal of South African Botany, Suppl. Vol. 12. 6) Pacific Bulb Society contributors "Haemanthus Species One" Pacific Bulb Society Wiki <http://pacificbulbsociety.org/pbswiki/index.php/HaemanthusSpeciesOne> version March 27, 2014. Web. 11 January 2017. 8) Du Plessis, N. & Duncan, G. 1989. "Bulbous plants of southern Africa". Tafelberg, Cape Town. 9) Manning, J., Goldblatt, P. & Snijman, D. 2002. "The color encyclopedia of Cape bulbs." Timber Press, Portland, Cambridge.